LyondellBasell Industries N.V. (LYB) is a Netherlands-based company that makes plastics and chemicals and refines petroleum—a classic petrochemicals stock—and an opportunity for investors who are seeking value in a stock market that remains expensive by historical standards. It pays a generous dividend of $4/share/yr., recently yielding 4.66%, that appears secure—the payout ratio is only 26%, which means the firm has plenty of cash after returning some to shareholders as dividends. 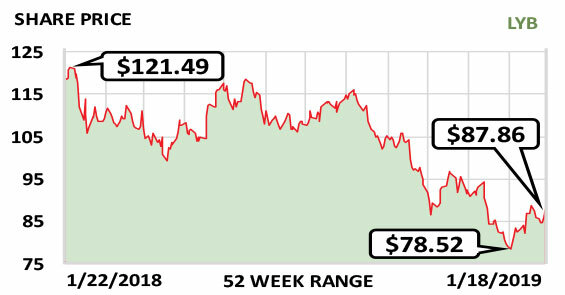 The company’s stock price has been held down by uncertainties about oil prices and the likelihood that they will remain comparatively low for some time. However, this simply makes it less expensive for LyondellBasell to get the petroleum that it processes into polyethylene and other chemicals. A costly leveraged merger led the company to file for bankruptcy protection in 2009, but it restructured and returned to the public stock market in 2010, and its finances are now carefully and conservatively managed. Revenue was $34.5 billion in 2017 and will likely be reported as $39.3 billion for 2018 and $41 billion this year. Fiscal year: December. Earnings per share: 2019 est./$15.65…2018 est./$14.95…2017/$12.23.